“Heads up!” What happens if you don’t heed that warning? You take your chances. A ball may be rocketing right toward your face! Athletes need to remain attentive. Keen attention is required for students. Some demonstrate it and some don’t. Those who don’t pay attention in class risk failing tests. To help distractible students, I seated them beside classmates with extraordinary powers of concentration. The children with tremendous focus provided good examples. The inattentive students learned to follow the lead of their neighbor. How can an eight year old demonstrate consistent focus? Maybe it’s because he gets lost of practice looking up. His small stature requires tilting the head to look at those in authority. The vast difference in size reminds the youngster of the adult’s greater power. That gives us a picture of what we can do. Tilt our heads to the heavens toward the One Who has great power. Mental illness (MI) can loom so large in our lives. What if we looked up to God more often? Would our perspective change? Photography offers a symbol of a transformed viewpoint. My new passion is snapping pictures from the ground. Looking up reveals surprises. Things appear much larger and more beautiful. Like the two pictures of the violin. I took several photos so we could advertise it on Craig’s List. Looking down, I captured a beautifully-crafted instrument in a humdrum context. The picture I took looking up made me smile. 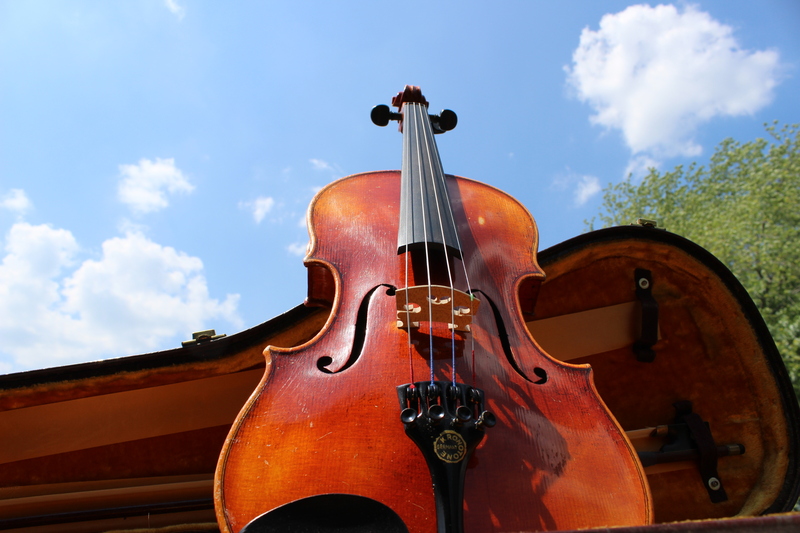 Surrounded by the sky, the violin became part of God’s creation. Likewise, we can view our journey with God’s plan as the backdrop. With that perspective, MI shrinks in its size and power over us. It becomes just part of God’s canvas for our lives. Come with me as I usher you into God’s Museum of Sovereignty. Stroll with me as we pass by paintings on the walls. Each one depicts a different life. We arrive at the portrait of your life. Pause and study the Artist’s work. At first glance, swirls of dark colors depict turmoil. Linger a bit and let the divine details draw you in. Search for the significance behind each stroke. Behind the shadows of your trial, you see splashes of His light illuminating your path. Suddenly you spot the beauty of His faithfulness. As you peer closer, you detect glimpses of His purpose. You contemplate the Artist’s meaning behind the characters and scenes. Trace the stream of your teardrops. They flow down the Mountain of Comfort and dissolve into the Pool of Insight. His power and love become as crystal clear as the water. Gratitude fills your heart. And you smile. When MI becomes so complicated and you don’t know where to turn, remember the advice: heads up! 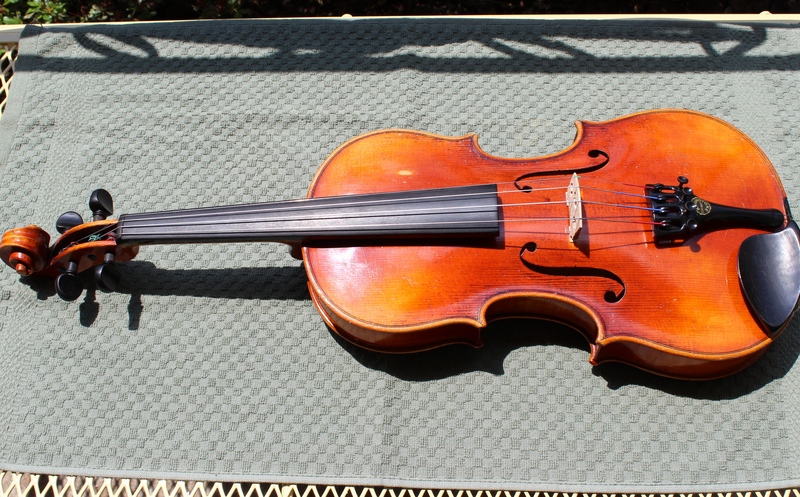 Close your eyes and see the violin surrounded by endless sky. Imagine that the violin represents your life. Think of the sky as God’s abundant hope. His endless peace envelopes your life. With eyes still closed, reflect on the sculpture He’s forming in you. He who begun the good work has promised to be faithful to complete it. We often begin our day praying for no problems. Hoping our day will be perfect. Rather than anticipating His perfection in the midst of trials. There it is. The ‘heads up’ we need. Look up to One Who is bigger than any of our problems. Hebrews 12:1-2 reminds us to look up in our journey. Reflect on God. He is above all things and thinks of you, above all else. Let Michael W. Smith’s song ‘Above All’ bless you.